At OPG we're always trying to find ways to make it easier for attorneys and deputies to fulfil their role. We know from calls to our contact centre and from user satisfaction surveys, that one of the most common problems attorneys and deputies face is proving an LPA, EPA or deputy order is legally valid to use. We’ve heard that attorneys carry around the full paper LPA document, complete with official stamps, to prove they're valid to banks, medical workers and estate agents. This is necessary to implement possibly life-changing decisions like selling someone’s house, approving major surgery or taking charge of their accounts. Yet the property agent, GP or bank teller often has to throw up a barrier to the process until he or she is satisfied that the sometimes well-thumbed sheets of paper the attorney or deputy is holding up are legitimate. To remove such barriers, we decided to publish sample powers of attorney and deputy orders online. We dug into our archives for examples of every version of an LPA we’ve created since 2007, when they were introduced, as well as EPAs and deputy orders. We showed an early version of the sample deeds to Baroness Finlay, life peer and independent chair of the National Mental Capacity Forum. 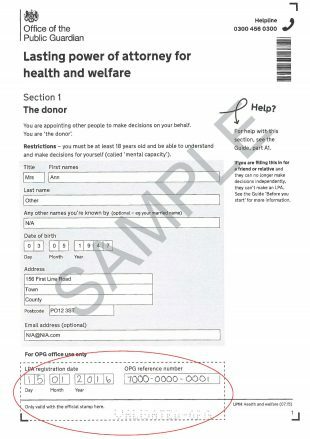 With her close awareness of the priorities of frontline medical, banking and other staff, the baroness suggested a small change: circling in red the official stamps on the sample deeds so staff could immediately identify relevant documents in real-life situations. We always keep a keen eye on web traffic when we publish a new service such as this, to find out whether it’s meeting the user need. Thankfully, views of the sample deeds have been encouraging since we launched them a couple of months ago: in the low thousands of hits for each deed type, which is about what we’d expect for documents such as this aimed at a fairly narrow group of users. Of course, there are really multiple types of users here: not only frontline staff but attorneys and deputies, along with the people they’re making vital decisions for. We hope that this simple strategy, of providing visual proof of what a legitimate deed looks like, will help attorneys and deputies to fulfil their role with minimal hassle.